I’ve whined before about how frustrated I am with boy clothes so when I was given the opportunity to try out the new Lullaby Line from Peek-a-boo Patterns I jumped on the chance. I’ve made a couple things for Toasty so far but to be honest I didn’t love them. But, after trying out these patterns I actually got excited. It might sound weird but being someone who has spent so many years sewing cute clothes (mostly for girls) and only really having girls in my family, it’s been a little rough for me that Toasty is a boy. Yes I am so excited for him, that’s not it at all but in my head part of being a mom was going to be sewing for my babe and I just didn’t know how/what to sew for a boy plus it took so much to get this little guy I’ve more or less assumed he’ll be our only kiddo. All that is to say that I’m very grateful for being able to make up these outfits because it allowed something to really click in me and get me excited about my little boy and being his mom in a way that I had just assumed I wouldn’t be. Kinda cheesy but we can blame it on the hormones. 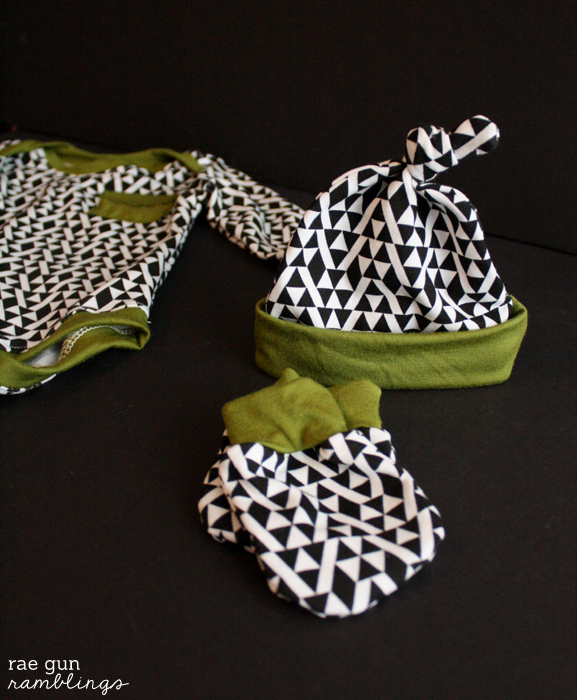 The Lullaby Line is made up of a bunch of great basics for babies I tried out the patterns for the body suit, hat, and mittens but I’m super excited to give all the others a go. 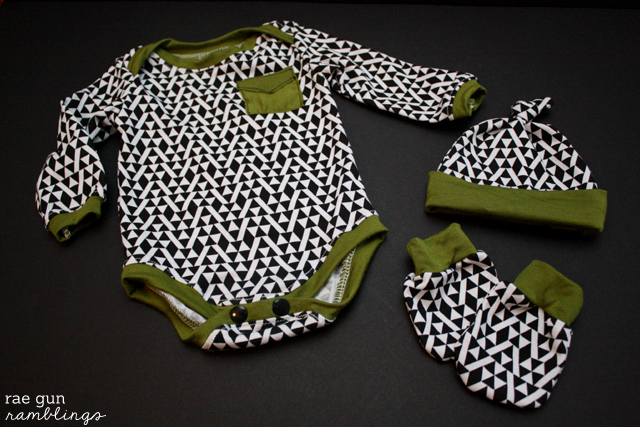 Since the little guy isn’t here yet I don’t have much to say about sizing although Amy has great tips and suggestions for picking the right size in the instructions. I was pleasantly surprised at how easy these came together. The directions are super clear and easy to follow (which I’ve come to expect from her patterns). But more than that these are FAST. I can definitely make these much faster than it would take me to get into the car drive to the store buy an outfit and drive home. Plus I rarely find anything I like in the stores anyways! Pretty much all pictures of me as an infant I had little baby mittens on, apparently I was a big scratcher and I’ve heard what a nightmare trimming baby nails can be. These little gloves come together so fast I’ve got a bag of scrap knits that will becoming mittens soon! But I think the hat is my favorite. It’s just so cute I can’t wait to put it on his wee head. The pattern actually comes with two other variations so I’m excited to try those out too. I didn’t make any changes just added a tiny fake pocket that was so easy. If you want to make your own you’ll just need to cut out a rectangle and then trim one side to a point. Then you fold over and iron down the point plus a little of the edge. 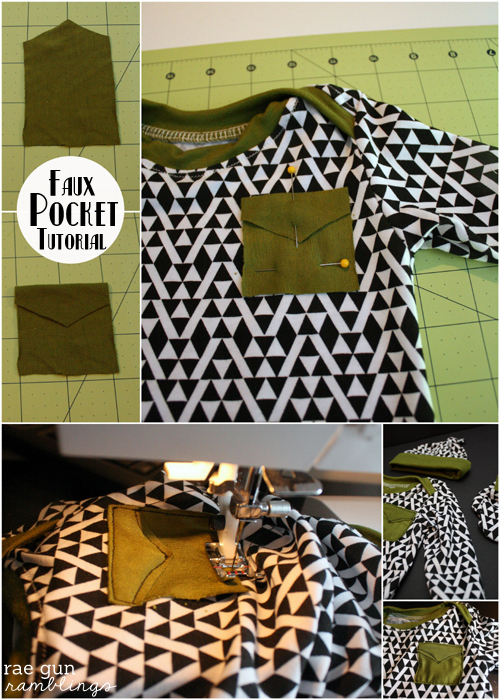 Pin the faux pocket on your finished garment and top stitch all around. You could stabilize it with some interfacing but I didn’t have any lightweight stuff and I didn’t want to take away from the coziness of the outfit. 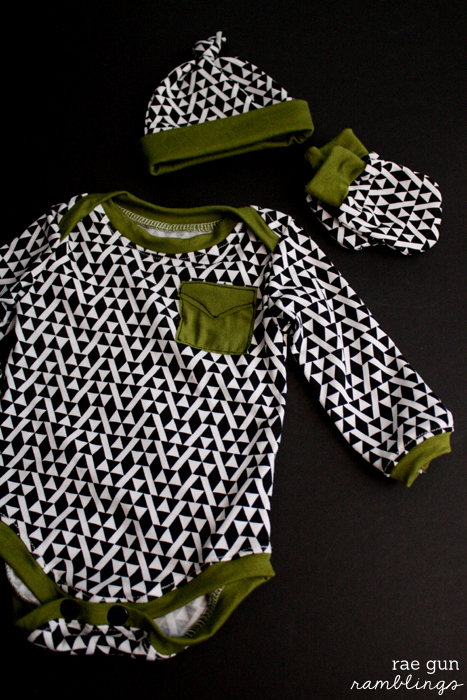 If you’re curious I found the awesome black and white print at Girl Charlee and used some green Sew Classic fabric from JoAnn Fabrics as the binding and contrasts. Make sure to check out how other sewing bloggers are spinning these cute patterns at Peek-a-boo Pattern Shop Blog and on all of the blogs listed below. 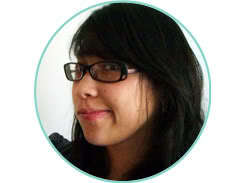 In honor of the pattern tour Peek-a-boo Patterns is giving away three 50$ gift certificates to the shop! I’ve blogged about a few of their patterns before and loved them all, really I don’t think you can go wrong the patterns are top notch and extremely well written. Enter the giveaway or stop by the shop to check out the selection if you just can’t wait! How cute are these! Great boy colors. 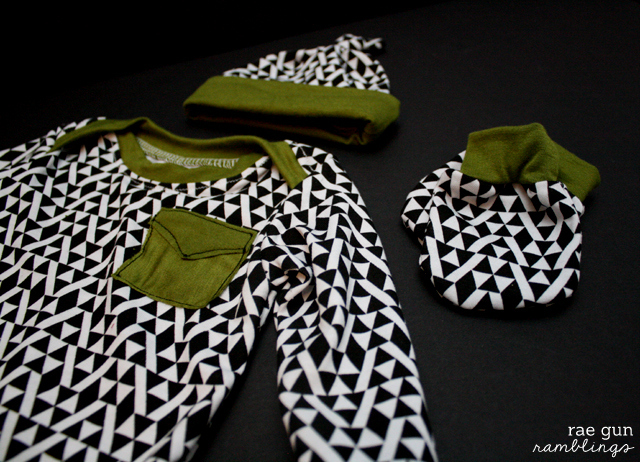 It can be so hard to find boy clothes so I love that there are great patterns for us to make our own! If I had all the money in the world, I would hire you to be my baby’s personal seamstress. She would be stylin! That is so adorable. Such a boy look without being typical and it is so stylish. 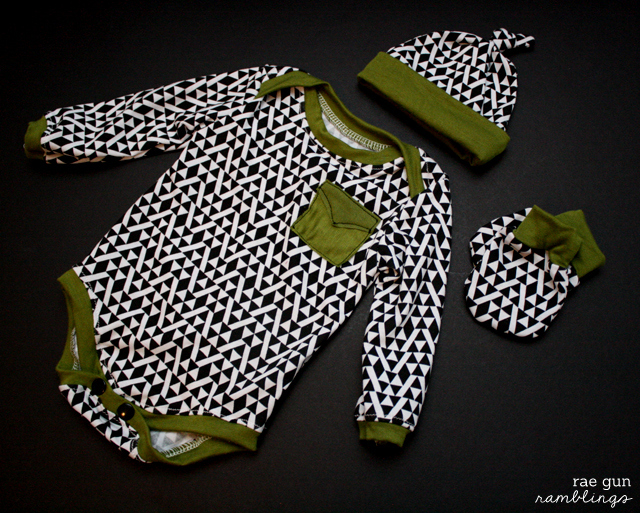 Such adorable little outfit! I’m actually excited you are having a boy. I have a feeling you are going to have a lot of creative boy stuff in the future. You’ll do wonderful! that looks so nice, I love your color/fabric choice! Oh my gosh! This is adorable! I love the colors and pattern. I love the color combination. That darker green is so adorable!